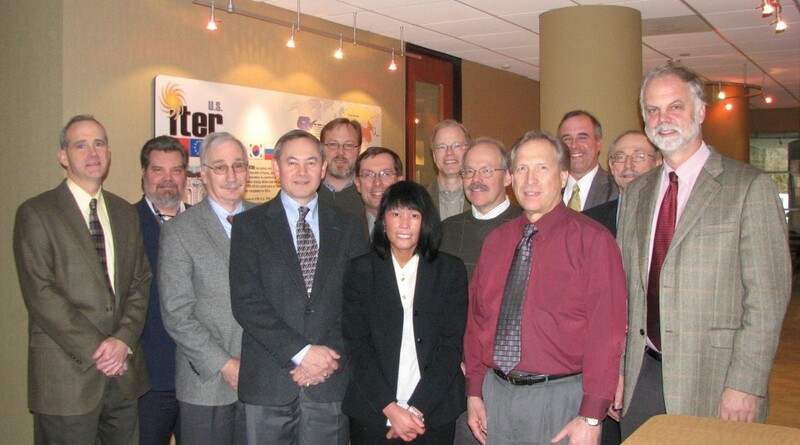 A team of project management experts from the US Department of Energy (DOE) visited the US ITER Project Office (USIPO) this week to review plans for all major systems and evaluate the progress of US ITER activities. The successful two-day review was led by Daniel Lehman, Director of DOE's Office of Project Assessment. He is the developer of this type of long-standing project peer review and evaluation procedure, which has consistently had a profound impact on DOE's large science projects being delivered on time and on budget. Known as the "Lehman Review," this concept has been promoted by the White House Office of Science and Technology Policy as a best practice for all US federal government agencies. These reviews are conducted periodically on Office of Science construction projects and large experimental equipment under fabrication. Areas examined during the USIPO review included efficient use of resources, strategy for setting performance baselines, procurement plans and consistency with ITER Organization schedule requirements, cost estimates and risk analyses, and effective organization and management. The review team determined that the Project Office is efficiently using its available resources to make reasonable progress and provide the US in-kind contributions to the ITER Organization in a timely way. USIPO's procurements for fiscal year 2010 were described as being aimed at achieving "credible and affordable" preliminary engineering designs for 2012. The team termed the plans consistent with ITER Organization schedule requirements that have been determined. The team found USIPO cost estimates to be near or at the upper limit of the established range, principally due to more risk events, better understanding of uncertainties, improved cost estimates from industry, and changing requirements. Reviewers also cited the strong USIPO leadership team; efficient management of budget constraints; use of a rigorous design review process; effective utilization of Integrated Product Teams; the use of value engineering methodologies to reduce costs; a "commendable" proactive approach in providing assistance to the ITER Organization with system engineering; and an effective strategy of engaging industry to help validate manufacturability, reduce costs, and mitigate risks. The committee concluded its positive report by congratulating USIPO management and recommending the implementation of a regular schedule of Office of Science technical, cost, schedule, and management reviews, beginning in late fall.